Throughout the school year we are always working on experiments. We have recorded some of this experimentation and have placed the videos on "You Tube" and "Teacher Tube" so that students can review our class lessons. 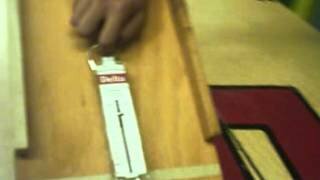 This video shows how the simple machine called a First Class Lever moves an object. This lever uses a half meter stick, ring stand, 240g mass and a spring scale. Using a half meter stick, ring stand, clamp, metal rod, spring scale and a 240g load, we set up a second class lever with the load in the middle of this lever system. 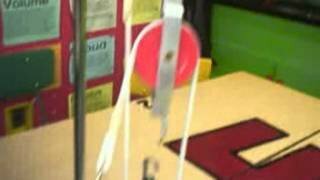 This video shows how the simple machine called a Third Class Lever moves an object. This lever uses a half meter stick, ring stand, 240g mass and a spring scale. 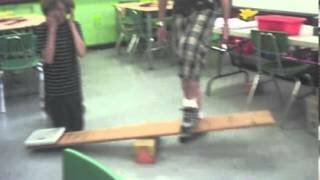 In this video, we use the simple machine, the free pulley to lift an object. The pulley system is made from a ring stand, clamp, rod, pulley, 240g load and a spring scale. 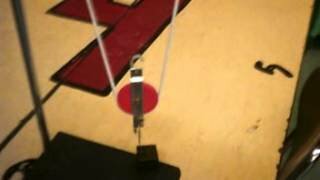 In this video we use two pulleys, a ring stand, clamp, metal rod, rope and a spring scale to lift a 240g mass. One pulley is put into a fixed position relative to the metal rod the other is free to move with the load. 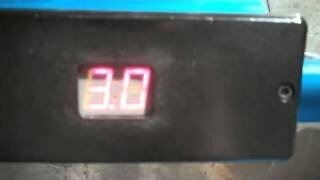 In this video we are dragging a 240 g load up different inclines. Our goal is to see if the steepness of the incline will cause the load to move up the incline easier. 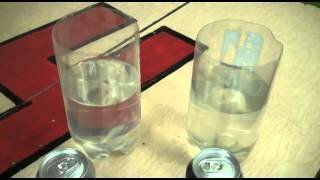 In this video we take an "empty" glass turn it upside down and plunge it into water. The water does not go into the cup. Something is keeping the water out. 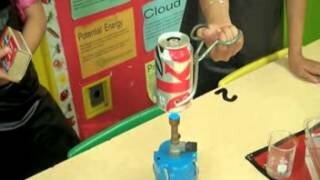 In this experiment, we heat a soda can to add energy to the air molecules inside the can. The energized molecules move away from each other causing some pieces of air to leave the can. There is now more air outside the can than inside the can. When the can is sealed by touching the top of the can to water, the outside air crushes the can. In this experiment, we use two hospital irrigation syringes and a piece of fish tank tubing to move air from one place to another and to force air into and out of the syringe. 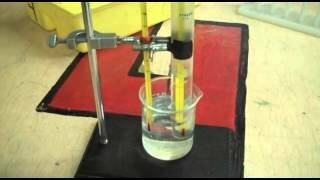 In this experiment we put a non filled balloon on a triple beam balance to find it?s mass. We then add air to the balloon and fill it up with air. The balloons end is tied into a knot to prevent air from escaping and the balloon is set on top of the pan of the balance once again so we can find the mass once more. 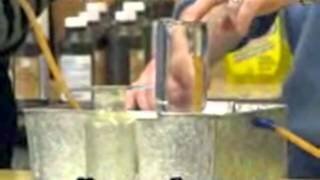 In this classroom demonstration we are breaking apart hydrogen peroxide to make oxygen gas. The gas is collected and sent to a collection bottle. The gas is then tested with a glowing splint. 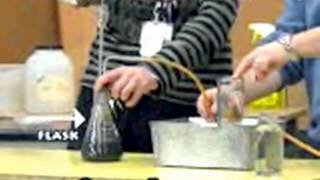 In this classroom demonstration we make hydrogen gas by adding hydrochloric acid to zinc in a flask. The gas is collected and sent to a collection bottle. 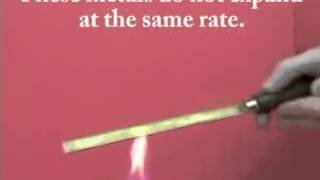 The gas is then tested with a lit splint. 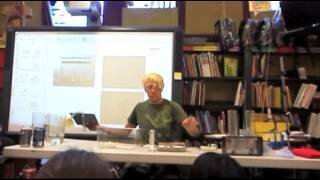 In this demonstration we use a tesla coil to add energy to gasses that are in sealed tubes. 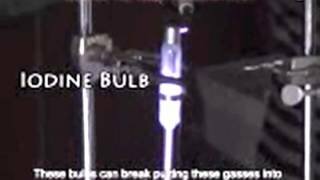 The added energy excites the molecules in these gasses causing them to give off light. 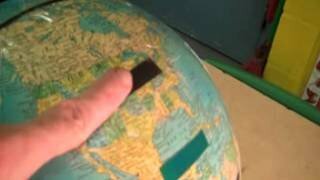 In this experiment, heat sensitive tape has been attached to the Northern Hemisphere of a globe in four places between the Equator and the North Pole. A heat lamp is aimed the equator of the globe. Students watch what happens to the four heat tapes over time. In this experiment we heat samples of four substances with a heat lamp taking the temperature every three minutes for 15 minutes. At the end of this period the lamp is turned off, however, we continue to record the temperature every three minutes. Our goal is to see which sample heats up faster and which retains heat longer. 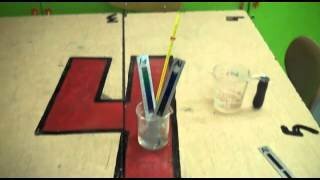 In this experiment, three cards are attached to a steel bar using only wax. The bar is clamped into a ringstand. The cards are marked A, B and C. A Flame is put to the metal bar closest to card A. 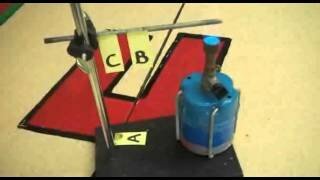 We want to see if heat will travel through the metal bar and move towards the cards. 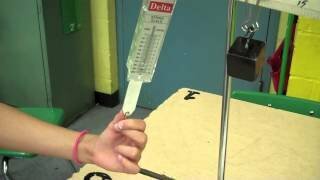 In this experiment, heat sensitive measuring tapes are attached to aluminum and iron bars. The bars are placed into hot water and the temperature is taken every 15 seconds. The temperature strips attached to the metal bars change color as heat is applied to them. In this experiment we have a brass ball and ring on separate handles. The ball just fits inside the ring. 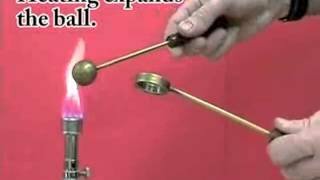 Heat energy is added to the ball from a Bunsen burner. The ball grows in volume as the molecules move away from each other. 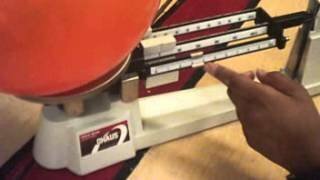 The ball no longer fits inside the ring. 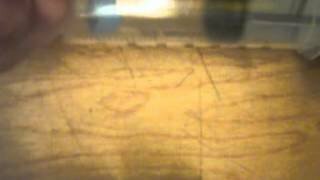 In this experiment we want to see if different materials expand at the same rate. We use a bi-metallic bar with one side containing brass and the other containing stainless steel. As we add heat energy to the bar, the materials show that they do not heat up or expand at the same rate. In this experiment we want to see if water at different temperatures will transfer their temperatures, if the liquids are put in a situation where they touch each other. 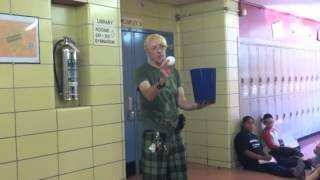 In this demonstration we place unopened cans of regular and diet soda into a tank of water to see if they would float or sink. Hot air rising and cooler air coming in to take the place of the rising air is convection. 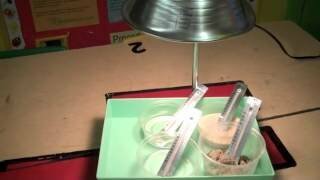 I this video, we build an use a convection box made from a plastic shoe box, some tubing, a funnel and metal plate. 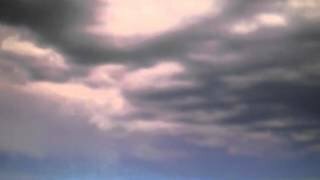 In this video we discuss low level clouds. These clouds form below 6,500 feet. In this video we discuss medium level clouds. 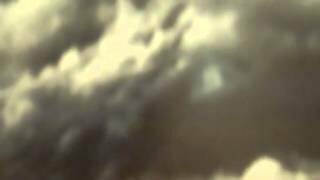 These clouds form with bases at 6,500 to 20,000 feet above the surface of the earth. 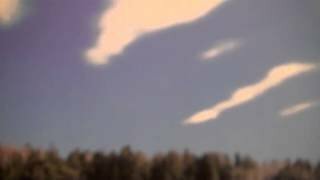 In this video, we discuss clouds that are above 20,000 feet. These are called high level or high altitude clouds. This video shows how the angle of the incline of a coaster track can cause a change in speed of the car riding on that track.